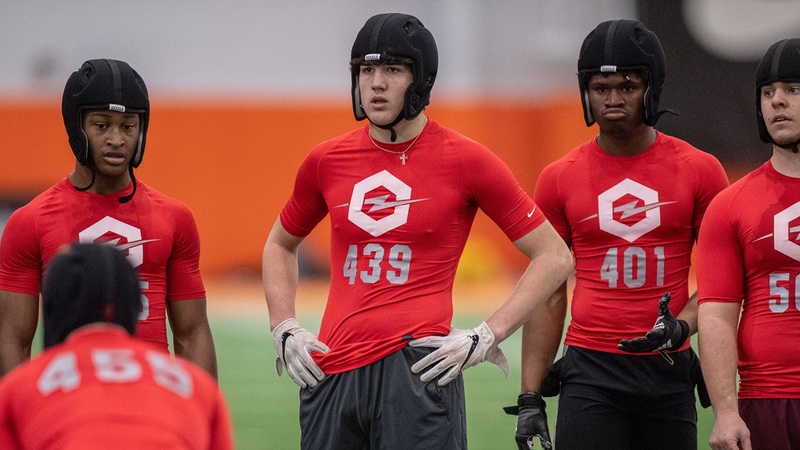 The Opening regional camp in Canton, Ohio last weekend was loaded with standout running backs including four who hold Notre Dame offers. Three of those players are in the 2020 recruiting cycle and are ranked as 4-star prospects. The linebackers at the camp had a tough battle going up against those players, but one of the individuals who rose up to meet the challenge was an athlete who holds a Notre Dame offer as well, 2021 recruit Yanni Karlaftis‍. The 6’4” 210 linebacker out of West Lafayette, Indiana had a solid day competing against the best of the Midwest even though his time to shine is supposed to be next year at this same camp. Where he fits on the field is something that he isn’t really sure of at this point. His brother is a defensive lineman who just enrolled at Purdue in January and the younger Karlaftis has the frame to possibly grow into a lineman at some point. He certainly didn’t look out of place competing at linebacker, though. He ran well in coverage so even if he adds a lot of weight, a position like the Drop in Notre Dame’s defense could be a match for his skill set. As far as his recruitment goes, he put things on the backburner this spring while he competed in another sport. Now that his season is over, he wants to get more involved again with getting out to South Bend something on his to-do list. With spring wrapping up in a week or so, it might be difficult for Karlaftis to arrange a trip up to watch a practice even if it’s something he said he wants to do. He definitely wants to get back on campus for a game, which is something he was able to experience before. “I went to a game last year too and I really liked the atmosphere so I want to go to another one,” Karlaftis expressed to me at the conclusion of the camp. His interest in Notre Dame is strong and more than just the game day atmosphere, it was what he saw from that defense that really gained his attention. Karlaftis has some edge to his game too and he displayed it at the camp. Instead of tagging off in the cat and mouse drill, he was wrapping up and trying to strip the football. When some running backs tried to trash talk to him, he didn’t back down an inch. Notre Dame is always looking for more players like that to add to their defense so it’s no surprise that Karlaftis holds an offer from the Irish this early in the process.